Kara Maria and Imin Yeh have hit the ground running, adapting to scavenging while also being incredibly productive. Within the first two weeks of their residencies Kara had nine paintings simultaneously in progress and Imin had created an entire alphabet of hand-carved movable type. Kara is experimenting with mark-making with found objects and plans on including representations of the wide range of animals at the facility—from hawks to flies—in her paintings. Imin has been carving wood printing blocks based on original artwork she’s found, and is also working on a quilt from discarded uniforms. Student artist Matthew Goldberg is collecting items that were once considered futuristic in order to explore our relationship to outer space. He’s been thinking about what might happen if we were to send our trash out into the galaxy—an idea some people have actually proposed. We’re excited to see what Kara, Imin, and Matthew will make in the coming months. Their end of residency exhibition will take place January 23, 24 and 27. After the Hayes Valley Farm closed in June 2013, we were the fortunate recipients of its cob oven. Though it took some time to build a new base and reinstall the oven, we completed the project in time for our last exhibition reception. 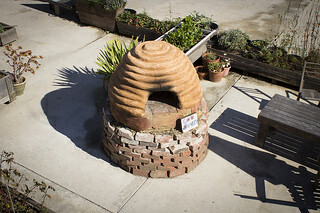 Shaped like a beehive, the oven is now in the vegetable garden behind the art studio. During the Saturday reception we cooked pizzas in the oven for the public, topped with vegetables harvested from our garden. The cob oven was built by Miguel Elliott of Living Earth Structures and participants of the Hayes Valley Farm’s permaculture course in May, 2012. 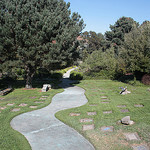 The farm was a volunteer-led community project almost a city-block in size, located on the site of a former freeway onramp at Laguna Street between Fell and Oak Streets in San Francisco. The farm existed for three years through an interim use agreement with the City. Today condominiums are being built on the land. We are honored to have the oven here and keep the spirit of Hayes Valley Farm alive. For more information about the Farm and the other urban agriculture projects it has inspired, visit hayesvalleyfarm.tumblr.com. We are currently in the process of selecting artists for 2015 residencies and will announce residency recipients in early December. If you are interested in applying for a 2016 residency, we will begin taking applications in late spring. The application deadline will be August 31, 2015. For more information about how to apply, please visit recology.com/AIR. 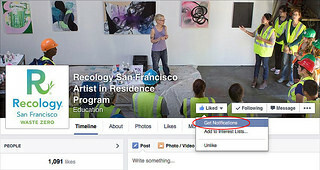 If you’ve liked the Recology Artist in Residence Program on Facebook, but aren’t seeing our posts, make sure to select “get notifications.” If you haven’t liked us already, you should! 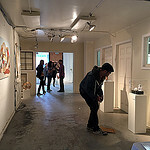 Work from the Recology Artist in Residence Program was recently exhibited at 2 Blocks of Art, an annual art walk on 6th Street in San Francisco. From January 5 to March 4 work will be exhibited in the lobby of 350/400 California Street, and from March 10 to 22 there will be an exhibition of Recology artwork in Los Angeles at the Voila Gallery at 518 N. LaBrea Avenue. In 2015, we will begin a Gardener in Residence Program, organized with the guidance of Garden for the Environment. 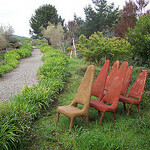 Gardeners will have access to the Recology Sculpture Garden for projects and will work on site for four months. Information regarding the program will be posted on our website in December. Re:New, an exhibition curated by Nemo Gould and Jeff Hantman and featuring new artwork by former Recology resident artists, is up at Lost and Foundry Oakland. Artists in the exhibition are Micah Gibson, Nemo Gould, Barbara Holmes, Ferris Plock, Lauren DiCioccio, Jeff Hantman, Benjamin Cowden, Yulia Pinkusevich, and Hannah Quinn. The exhibition will be on view through November 22, by appointment only. James Sansing is the recipient of a 2014/15 Pollock Krasner Grant for painting. His film Verses is included in the Biennial of the Moving Image (BIM) in Buenos Aires in November, and he has been commissioned by Christian Dior to create three paintings for their Soho location in New York. Lauren DiCioccio’s recent solo exhibition at Jack Fischer Gallery was reviewed by Kenneth Baker in the San Francisco Chronicle.She is currently an affiliate artist at the Headlands Center for the Arts. Work by Jeff Hantman is included in the 28th Annual Emeryville Art Exhibition. The show runs through November 2, and is open daily, 11am-6pm. He is also in an exhibition at The Compound Gallery, opening November 1, and will have several works on exhibition in the space’s new Fabrefaction Gallery. Work by Stephanie Syjuco is included in the Alien She exhibition at Yerba Buena Center for the Arts, on view until January 25. She is also currently at the Workshop Residence where she is developing a collection of garments featuring a non-repeating dazzle screen print inspired by the camouflage systems used on WWI battleships. Jeremy Rourke will be screening and performing with his stop-motion collage videos at Shapeshifters Cinema in Oakland on November 16. He will be showing a number of works, including the videos he made during his Recology residency. Sirron Norris, Val Britton, and current Recology artists-in-residence Kara Maria and Imin Yeh all participated in the October 26Passport event, an annual art walk sponsored by the San Francisco Arts Commission Gallery. 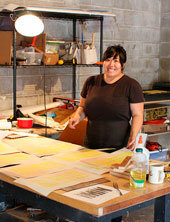 Karrie Hovey is spending October at the Brush Creek Artist Residency in Saratoga, Wyoming. She is also an affiliate artist at the Headlands Center for the Arts, and will be exhibiting in the Shunpike Storefronts program in Seattle which enables artists to exhibit their work in vacant storefronts. Her work will be on display on Republican Street in Seattle from November to March. Samuel Levi Jones is the recipient of the Joyce Alexander Wein Artist Prize given by the Studio Museum in Harlem. The $50,000 prize is awarded each year to one artist “who demonstrates great innovation, promise, and creativity.” Previous recipients include Gary Simmons, Glenn Ligon, and Lorna Simpson. He also has a solo show, Black White Thread, opening November 8 at Papillion in Los Angeles. Reddy Lieb will teach glass workshops on November 9 and December 7, 10am-4pm, and a mini workshop on November 30, 1-3pm. Workshops are held at 3535 19th Street. For more information, fees, or to register, please contact Reddy. Nemo Gould appears in Maker, a documentary on the maker movement. Michael Kerbow was awarded a grand prize for his painting Critical Mass in the juried show Real Surreal at Sandra Lee Gallery in San Francisco. As part of the award he will be given an exhibition at the gallery in 2015. Colette Crutcher has completed another mosaic stair project in collaboration with Aileen Barr, the Arelious Walker Stairway in Hunters Point off of Innes Street near the shipyard. She is also working on a grouping of mosaic-clad sculptures that will be installed at Taraval Street and 48th Avenue in early 2015. Yulia Pinkusevich was selected to create a sculptural seating centerpiece for the new McMurtry Art and Art History building, designed by Diller, Scofidio & Renfro, at Stanford University. Julia Goodman will teach a tin can papermaking workshop at INTUIT: The Center for Intuitive and Outsider Art in Chicago on November 22. Her recent beet papyrus work The Root of Scarcity, 2014 will be included in Rooted in Soil, a group exhibition at the DePaul Art Museum, January 29 to April 26, 2015. Bill Russell will show a series of new abstract paintings in a group show November 15, 16, 22 and 23 from 10am-4pm at ArtBrokers Gallery, 425 Irwin Street, San Rafael. Mike Kendall will participate in Benicia open studios the first weekend of December. For more information:http://mikekendall.com/. Paula Pereira, working collaboratively with Swedish artist Pernilla Andersson as t.w.five, will have an installation in the Luggage Store’s new Lower Haight exhibition space. Entitled, Automaton X, the exhibition will open November 15, with a reception at 7pm.Luggage Store Projects @ 457 Haight. Christine Lee will be an artist-in-residence at the Anderson Ranch Arts Center in Snowmass Village, Colorado in February. Scott Kildall is finishing up a residency at Impact Works in Utrecht in the Netherlands. During the residency he has made a new online art project called EquityBot, a stock-trading algorithm that “invests” in emotions such as anger, joy, disgust and amazement. During stock market hours, EquityBot tracks sentiments on Twitter to gauge how the world is feeling and links these emotions with actual stocks to make investments using a simulated brokerage account. 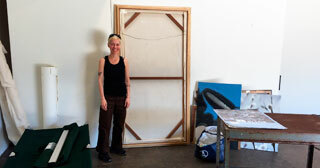 Kristin Cammermeyer was a recent visiting artist at UC Davis. Mid-May through June she will be producing new work at The Hedreen Gallery at Seattle University in Washington. Ethan Estess is currently at the Nautilus Lanzarote art residency in the Canary Islands, using materials he finds on the beaches and streets to tell stories about the island’s people and environment. His collage series, Marine Mammals of the Western Hemisphere, will be exhibited at the Pacific Grove Art Center, opening January 9. He began the series when he stumbled upon a 1970s whale poster in the dump during his Recology residency. 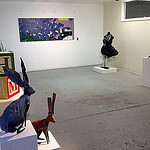 Matthew Gottschalk is an artist-in-residence in the Jail Cell studio at Alter Space in San Francisco. His solo show there, This Is Where Home Is, opens December 6th. He will also have an installation, The Higher We Rise, The Further Away I Seem, in the San Francisco Arts Commission Gallery’s Grove Street Windows opening December 16 with an artist talk January 10. Scott Oliver’s proposal for a public artwork at the corner of Masonic Ave. and Geary Blvd. was chosen by the SF Arts Commission. Entitled Points of Departure, it will be fabricated by San Francisco-based Gizmo Art Production and is expected to be installed in spring, 2016. The garden is just lovely! I love it!